From the A3, take the Thalwil Exit. Then drive towards Adliswil and count the roundabouts. If you come from Zurich, then you have one roundabout to go straight across, if you drove on the A3 towards Zurich, go right at the first roundabout at the A3 exit, then right at the next rounabout. Then on roundabout that is to follow, take the first exit right. You will cross the highway on a bridge, then after 100m turn left towards the Swiss Re Center of global Communication. Drive straight for another 300m, then bear right and after another 200m, directly after the Swiss Re center of global Communication you will see our church. You are welcome to park in front to drop people off, then we ask you to park your car in the underground parking garage of the Swiss Re Center. There are signs. We have three parking places in front of the Church reserved for people who are physically challenged. Take the S8 or S24 train to Rüschlikon. There is a blue minibus (Thalwiller Taxi) paid by the church, leaving the train station at 10:20. The minibus meets the S8 train which leaves the Zürich HB at 10:07, platform 32 (subject to change, check the SBB website below). From the other direction, the S8 from Pfäffikon SZ arrives at 10:06. If you prefer to walk, it is around 15 minutes uphill. Alternatively, you can catch the bus 165 from ‘Rüschlikon, Bahnhof’, Direction Rüschlikon, Park im Grüne. Get off the bus at ‘Rüschlikon, Säumerstrasse’. From there it is around 500m to walk to the church. 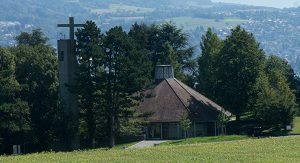 After the service, at 12:15 the minibus will again take you directly to Thalwil train station, free of charge.